honey and oats are a great combination. they work together so well in cereals, so why not pancakes? 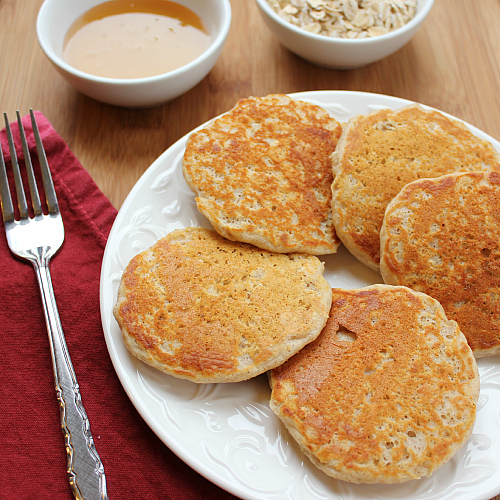 i found the recipe for these honey and oat pancakes in adrianna adarme's pancakes cookbook and put it on my to-make list of breakfast foods as soon as i saw it. we loved these pancakes so much, and we have made them again a few times since then. 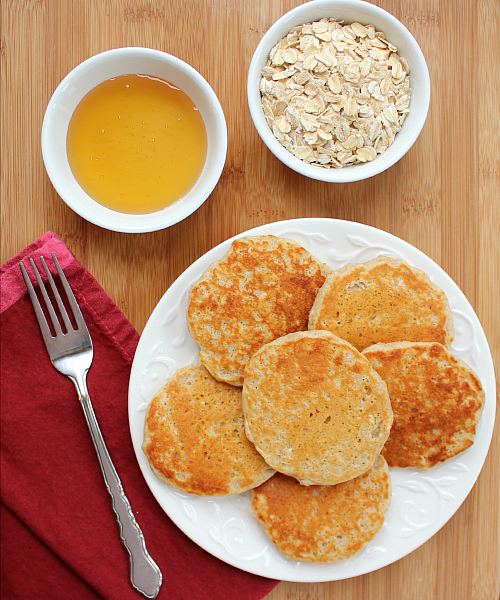 the honey gives these pancakes a great flavor and the oats give them a nice crunch. combine the flours, baking powder, and cinnamon in a large bowl. in a separate bowl, whisk together the milk, honey, and egg. beat until well combined and the honey has dissolved. add the wet ingredients to the dry ingredients and mix until combined and no lumps remain. gently fold in the oats. heat a lightly buttered griddle or frying pan on medium heat. pour 3 tablespoons of batter onto the griddle for medium pancakes. cook for 3 minutes, until small bubbles begin to form. flip the pancakes when they start to bubble, then cook for 2 minutes, until they are golden brown and cooked throughout. once cooked, transfer the pancakes to a baking sheet and place in a preheated 200 degree F oven to keep warm while you cook the remaining pancake batter. serve warm with maple syrup or honey. That looks very good. As a matter of fact, I am having some local honey in my tea right now.